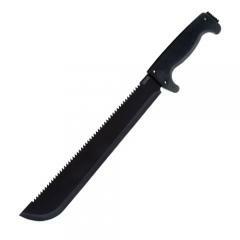 Add a MC-01 SOGfari machete to any outdoor enthusiasts gear. SOG's machete offers a straight and sawback combo blade crafted from 3CR13 stainless steel. The blade itself is finished in a durable and sleek-looking black powder-coating that resists damage from corrosion. The dual blade guarantees impressive cutting through rugged terrain, whether trailblazing, clearing brush or collecting wood for a shelter. The Kraton handle is aimed to provide maximum comfort during extended use and includes a hole that fits most lanyards. A nylon sheath is included for convenient and safe storage and transport. At only 13-ounces, SOG's versatile machete won't weigh you down.